On 12 June, the Conference of European Statisticians (CES) held under the auspices of UNECE in Geneva, endorsed a set of recommendations for a framework to measure sustainable development and associated sets of indicators. This framework is a key step towards harmonising the various approaches and indicators already used by countries and international organisations to measure sustainable development. It is expected to contribute to the UN processes for setting Sustainable Development Goals (SDGs) and defining a post-2015 development agenda. The Report on framework for measuring sustainable development has been developed by a Task Force set up jointly by UNECE, the Statistical Office of the European Commission (Eurostat) and the OECD. It takes into account various initiatives undertaken by the United Nations, Eurostat and the OECD, as well as by individual countries, and provides analyses of current measurement frameworks. In keeping with the Brundtland Report, it also argues that sustainable development is essentially about distributional justice, in both time and space. This means that the distribution of well-being between the present and future generations, as well as differences in well-being between countries are key parameters. human well-being of the present generation in one particular country (‘here and now’). While there is no universal consensus on all its dimensions human well-being should be defined according to what people themselves regard as most important in their lives. These dimensions can be measured through a mix of subjective and objective measures. well-being of future generations (‘later’). The well-being of future generations is dependent on the resources the current generation leaves behind. Assets that should be preserved for future generations fall under four main types of capital: economic, natural, human and social capital. Measures of the current levels of capital and their changes over time show how the choices of the present generation might impact on future generations. Work on the measurement of aspects of human and social capital is currently undertaken by the CES and the OECD. Human capital is defined as the knowledge, skills, competencies and attributes embodied in individuals that facilitate the creation of personal, social and economic well-being. Social capital includes the trust that is built through the repeated interactions between citizens. well-being of people living in other countries (‘elsewhere’). The ‘elsewhere’ dimension captures the ways in which countries affect the human well-being of the rest of the world, for example, through international trade, financial transfers, migration, etc. 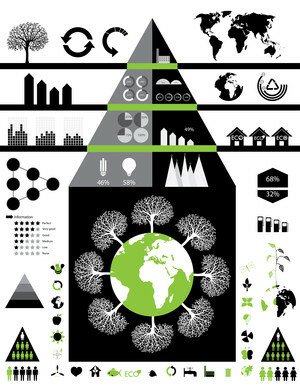 Specific themes of sustainable development that should be measured are also identified. Twenty themes (see Annex 1) are distinguished covering environmental, social and economic aspects of sustainable development: subjective well-being, consumption and income, nutrition, health, housing, education, leisure, physical safety, trust, institutions, energy resources, non-energy resources, land and ecosystems, water, air quality, climate, labour, physical capital, knowledge capital, and financial capital. Population has been added as a context indicator. a large set of 60 indicators to provide information about the dimensions of well-being in the ‘here and now’, ‘later’ and ‘elsewhere’ (see columns 1-4 in Annex 1). Several of the indicators relate to distributional issues. The conceptual approach shows to what extent the choices made today may lead to problems ‘elsewhere’ or ‘later’; this approach is rooted into economic theory and is more amenable to economic modelling. a small set of 24 indicators, to ease communication with policymakers and the general public and ensure a common basis for international comparison (see Annex 2). The data needed to produce the indicators in this set are already available today (see Annex 3). The selection of themes and indicators is based on an analysis of the sustainable development themes and indicators currently used in several national and international datasets. The availability of data for the selected indicators for 46 countries (EU and OECD member countries and Brazil, Russia, India, Indonesia, China, and South Africa) in international databases was also analysed (see Annex 3). Most suggested indicators are already produced by national statistical offices and collected by international and supranational organizations such as the United Nations, the OECD and Eurostat. The framework does not propose a one-size-fits-all approach, but rather presents a flexible tool that can respond to a variety of needs. Once the SDGs have been established, the suggested indicators could be aligned with the Goals. In addition, although the proposed sustainability themes are universal, there is room for selecting country-specific indicators. The Report identifies a number of measurement issues that will need to be addressed in the future. In particular, more work needs to be done on measuring the international aspects of sustainable development (i.e. the impact of countries on each other) and constructing better indicators in the areas of human, social, financial and natural capital (including better measures of their distribution). Data on time use can be used to measure those non-market activities which are relevant to sustainable development. In the post Rio+20 policy context, the framework is expected to inform the selection of SDGs and to lead to greater harmonisation of national and international sets of sustainable development indicators. The work of the Task Force also links to on-going policy initiatives on the development agenda post-2015, as shown in Annex 4. The framework used in this report builds on the Brundtland Report (1987), economic theory, social sciences, as well on the Stiglitz-Sen-Fitoussi report (2009) and other international initiatives. It takes into account existing approaches used by the various initiatives undertaken by United Nations, the European Commission and the OECD, as well as initiatives of individual countries. Examples include the European Commission’s work on ‘GDP and beyond’, the recommendations of the EU Sponsorship Group on Measuring Progress, Well-being and Sustainable Development, and the OECD Better Life Initiative. The work has been done by the Joint UNECE/Eurostat/OECD Task Force on Measuring Sustainable Development, as a follow-up to the report on measuring sustainable development endorsed by the Conference of European Statisticians in 2009. The 2009 report focused mainly on the inter-generational issues of sustainable development using capital measures.